Listeria monocytogenes is a bacterial pathogen that causes the foodborne disease listeriosis. The most common route of human infection is the consumption of contaminated Ready–to-Eat foods (RTE). Within those, cold-smoked salmon is of particular interest as it presents high prevalence of L. monocytogenes at retail stage. Recent developments in genome sequencing open new opportunities for explaining the intraspecific variability of phenotypes (e.g. virulence, growth behavior). Successful association between WGS-data and specific phenotypes is thought to contribute to better predicting microbial behaviors. Implementing this information in hazard identification, exposure assessment, and hazard characterization processes will refine QMRA-models. The aim of this study was to compare two QMRA approaches. In the first approach the association between genotypes and phenotypes was taken into account. These results were compared to those obtained with classical QMRA. 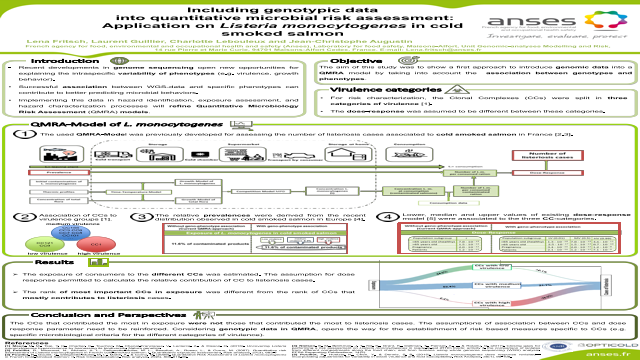 The used QMRA-model was previously developed for assessing the number of listeriosis cases associated to cold smoked salmon in France (Pouillot et al., 2009 and 2011) and for assessing the efficiency of communications targeting to consumer (ANSES, 2015). The global prevalence in the existing model was replaced by the specific prevalences for each clonal complex (CC). These relative prevalences were derived from the recent distribution observed in cold smoked salmon in Europe (Moller-Nielsen et al, 2017). For risk characterization, the CCs were split in three categories of virulence according to a recent publication (Maury et al. 2016). The dose-response was assumed to be different between these categories. Lower, median and upper values of existing dose-response model (Pouillot et al., 2015) were associated to the three CC categories. The exposure of consumers to the different CCs was estimated. The assumption for dose response permitted to calculate the relative contribution of CC to listeriosis cases. The rank of most important CCs in exposure was different from the rank of CCs that mostly contribute to listeriosis cases. The CCs that contributed the most in exposure were not necessarily those that contributed the most to listeriosis cases. The assumptions of association between CCs and dose response parameter need to be reinforced. Considering genotypic data in QMRA, opens the way for the establishment of risk based measures specific to CCs. Summary: The aim of this study was to compare two QMRA approaches. In the first approach the association between genotypes and phenotypes was taken into account. These results were compared to those obtained with classical QMRA.References: 1] Maury, M. M., Tsai, Y. H., Charlier, C., Touchon, M., Chenal-Francisque, V., Leclercq, A., & Disson, O. (2016). Uncovering Listeria monocytogenes hypervirulence by harnessing its biodiversity. Nature genetics. Pouillot, R., Goulet, V., Delignette‐Muller, M. L., Mahé, A., & Cornu, M. (2009). Quantitative Risk Assessment of Listeria monocytogenes in French Cold‐Smoked Salmon: II. Risk Characterization. Risk analysis, 29(6), 806-819.00.